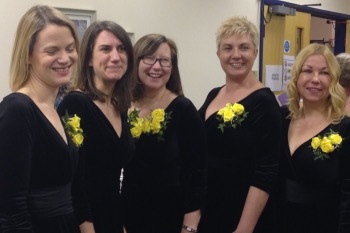 What makes Black Sheep Harmony special for our singers? "Singing With Black Sheep, lifts my soul like nothing else can." 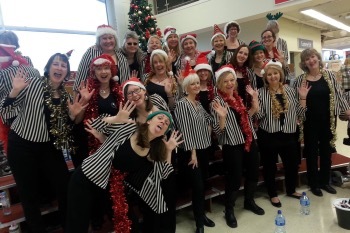 "Being a member of Black Sheep Harmony has done so much for my singing voice by teaching good techniques and enabling me to be more confident that I have the ability to sing in tune with sensitivity". "I love it because my headspace is all about singing, meeting friends and having a great time for those few hours per week." "I joined at the beginning to make some friends because I was lonely, was keen to do something where I could use my brain and I badly needed to have some 'me time' away from my young family. Four years on, I got all that, gained confidence and was much more than I could ever have imagined at the time when I first stepped in the door. It's my future". "Singing with Black Sheep has made a huge difference to my life: It is not so much a hobby, as a way of life! The friends I have made have been the best in all my life and my singing has improved so much. The satisfaction I get and the fun I have, lifts my spirits each and every Thursday." "A friend introduced me to Black Sheep Harmony over three years ago. At that first rehearsal, I heard and joined in with fabulous four part close harmony that is the hallmark of the chorus. I have not looked back, I have made great friends, my vocal technique is improving and now I am also proud to have the chance to sing in quartets. All thanks to BSH." Interested? We’d love to invite you to our next rehearsal as every week is an open evening. So do please come along, try us out as we are a really friendly bunch and see first hand what makes our girls come every week! Just turn up or get in touch with us to let us know you are coming.